We received these wonderful hats from our dear friend Nancy. We were so overwhelmed with joy when she contacted us to let us know that she was back to work on all of these wonderful hats. She told me that her husband came accross her yarn stash and told her she needed to get rid of some of it. We are glad he did as pictured above is the result of her purging. She even has a new idea for creating a security octopus for our NICU warriors and she is working on those for her next donation. We can’t wait to see her new creations as she is such a talented crocheter. My 9 year old daughter recently decided that she wanted to make hats to give to others in need. So I taught her how to use the loom and above are her recent creations. She has quite the eye for colors. She mixed yarn colors I would never had thought to do. She was definitely born with more artistic skills than I have. She is just beginning to hone her skills and I hope to see some more creations form her in the future. So proud to have a daughter that has the desire to give back and happy that I can help to instill the importance of giving back. I knitted these 2 baby hats on the loom a few weeks ago but am just now able to show them to you. These hats will keep 2 babies in the NICU warm, which is important to their survival –something I just learned when we spoke to Cindy,who is traveling to Guatemala. I enjoy loom knitting, but really can’t make as many hats as I’d like to– as school is my main focus. These will be included in our next delivery, which makes me very proud! Welcome to the world- Baby Gwen! Gwen was born in late January in Ontario, California 5 weeks earlier than expected weighing a little over 3 pounds. We are so proud to see that such a beautiful baby wearing one of our hats! Her mother graciously shared her pictures and story of this beautiful baby with Knitting Rays of Hope! It’s so inspirational to see our hats on our babies and cancer warriors! We are making a difference! Knitting Rays of Hope impacts lives and families! Thank you, Sarah for sharing your beautiful baby girl with our Knitting Rays of Hope community! You have inspired us to continue our works in Hope, Love & Faith! This is our first time delivering to Queen of the Valley, which has a 40 bed Newborn Intensive Care Unit, one of the largest in the area. We are proud and very grateful to have a dedicated team that helps us spread hope! With this shipment, our counter is at 2,865 hats donated by the Knitting Rays of Hope Team! This is so amazing and we appreciate everyone who has made this possible! 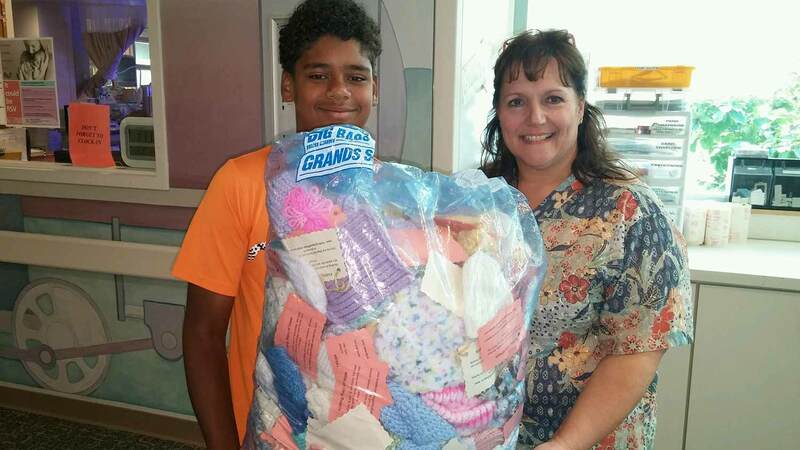 My 10 year old son and Teresa, a NICU nurse with the bag full of 241 NICU hats! or leave a comment on our blog :).